Service. Superior Craftsmanship. Customer Satisfaction. Firstly, thank you for visiting my website and taking the time to check us out. I can appreciate wanting to know who it is you’re about to hire for a job or buy a product from. It’s important to feel comfortable with your decision. I do the same in my life. I designed the site (and maintain it) myself with the hope of showing you what it is I do best and more importantly, who I am. There’s no punches pulled. What you see is what you get. I got into construction 20 years ago not knowing what to expect. I was just looking for a better paying job and hoping for some sort of advancement. After working as an assistant manager at a local hardware store for a few years I began to realize my corporate ladder was only 4 feet high. :) So it was time to explore. I answered an ad in the newspaper from a major drywall company that was looking to hire and train someone to finish drywall. 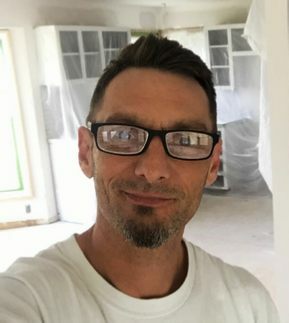 I took the job and quickly found out it was something I enjoyed (one thing I inherited from my dad was working with my hands) and after 3 or so years of my teacher putting me through the ringer ( He was a perfectionist to the extreme) I became good enough to break out on my own and start sub-contracting for big drywall companies. I was basically a free agent for whomever needed work done. I spent about 7-8 years sub-contracting my skills for other companies. Little did I realize at the time how crucial those years would prove to be in having my own business later. I learned a lot from those years. Mostly, what NOT to do. That’s how my company would eventually get started. I never really had any intention of going into business for myself because I was content just doing what I enjoyed no matter who I worked for. But over the years my role for these other companies began to change. I went from being a finisher that was used specifically for high end show home’s, to their “go to guy” that would be expected to smooth things over with their angry customers who’s jobs were poorly done. It bothered me that their customer’s were often being neglected or outright ignored and provided sub par work to boot. And believe me it became routine. In short, they would send me in to fix someone else’s mess. It was a bittersweet time. On the one hand, I felt used by the corporate style drywall companies and on another I got the satisfaction of helping people resolve their issues and finally get what they paid for. That’s when a light went off. I decided it was time to offer people my best, my way. You hear it all the time, sometimes companies get too big and forget the important things. People. That’s the single most important thing I strive to maintain in my business. Relationships. And frankly, that’s the best part of my job. Meeting, getting to know, and helping people that become my customers. You’re more than just a customer. More like family that you don’t mind seeing :) That factor alone sets my company apart from other’s. I hear all the time from potential clients that called Joe Contractor and either never heard back from them, didn’t show up when they said they would, or just did a flat out lousy job. My thought; If I’m running late to or have to reschedule an appointment, it doesn’t take much to pick up the phone or text someone and at least let them know what’s up. So here I am. My mission for this company is simply to offer folks the best product I can (hopefully surpassing your expectations) at an affordable price. But more importantly, feeling confident that you hired the right guy for the job. Thanks again for your time.